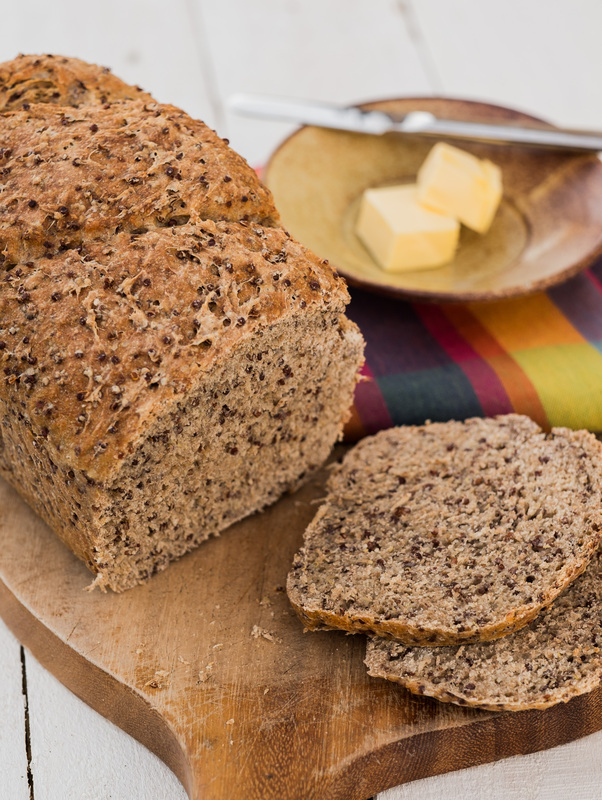 This moist, filling loaf is full of the goodness of wholemeal spelt flour and whole quinoa. Spelt is an ancient form of wheat, lower in gluten and often tolerated by those who find wheat just doesn’t suit them. 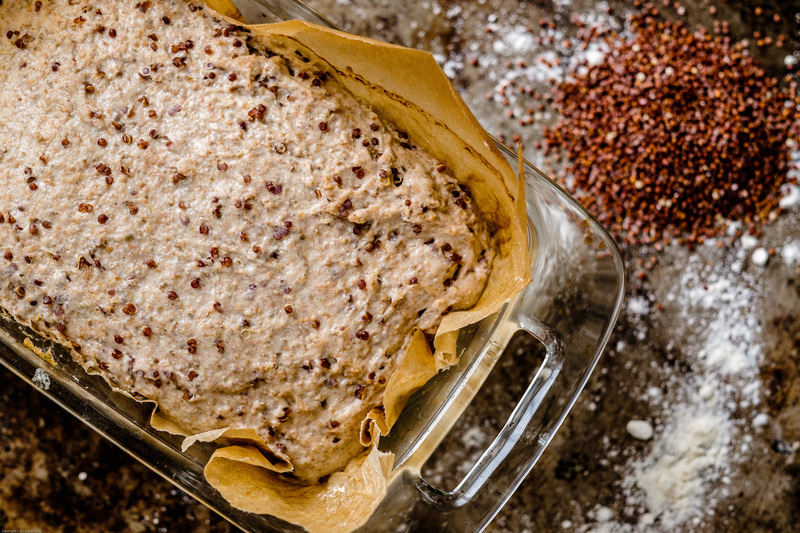 Quinoa adds a nice texture and increases the protein content of the loaf, and is a handy way to utilise leftover ‘grains’ (barley, millet and other grains can also be substituted). Red quinoa makes a particularly pretty addition. Combine sourdough starter, water and flour in a bowl and mix until it comes together into a shaggy dough. Rest for 20-30 minutes, then add quinoa and salt, kneading for a few minutes until the ingredients are all worked in. If it is too wet or dry at this point (the dough should feel tacky but be more interested in sticking to itself than to your hand) add more flour or water gradually, rest and knead again. Shape the dough, either folding it gently into a log or tucking the sides under to make a boule, and place in a loaf tin or banneton. Mist with water or cover with a damp tea towel to prevent the surface from drying, and let the bread rise for 4-5 hours in a warm, draught-free spot. Alternatively, you can pop the dough into the fridge and let it ferment slowly for up to a couple of days. About two hours before you intend to bake, remove from the fridge and let the dough return to room temperature. 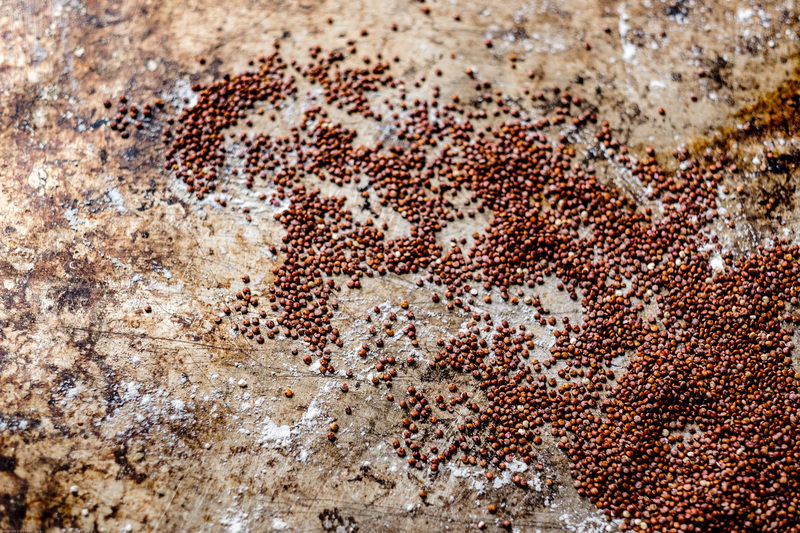 This will result in a tangier, but even more nutritious loaf, as the lactobacillus bacteria have had longer to break down the phytates, lectins and other hard to digest substances, allowing the nutrients in the grains to become more bio-available. Preheat the oven to 220 degrees and score the loaf. Bake the loaf in its tin, on a baking sheet, or in a (pre-heated) dutch oven if you like a crunchy crust. Turn the heat down to 180 degrees after 10 minutes, then bake for a further 45 minutes. The crust should be a golden brown colour. Test to see if the loaf is done by tapping on its underside. If it doesn’t sound hollow, return to the oven for a further 10-20 minutes. Allow to cool before slicing. I love a slice, still slightly warm, slathered with cultured butter. Stores well for up to a week in a paper bag, though after a day or so is nicest toasted. It can also be sliced and frozen.